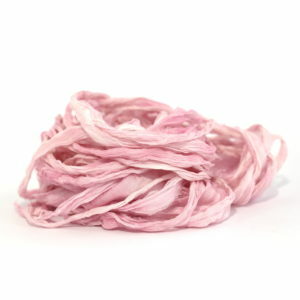 Our hand-dyed recycled sari silk ribbon is very popular in shade Flamingo (amongst many other colourways), so now we have hand-dyed the chiffon ribbon to match! Available from today, this pretty pastel pink lightweight ribbon will compliment your flower bouquets, mixed media art, dream-catchers, etc beautifully. Share your pictures of how you use the ribbon (or any Perran Yarns!) on our Pinterest ‘Customer Makes’ page at https://www.pinterest.co.uk/perranyarns/customer-makes/ – let us know and we’ll send you a free ribbon pack with your next Perran Yarns purchase! ← It’s the Woolly season!